Do you like playing golf? You live in the right place. There are well over 1,000 golf courses in Florida, more than any other state, and of course the weather lets you tee off year round. If you're looking for a Tampa golf course, there are plenty of options for any level of golfer. But we understand not everyone has the budget to play TPC Tampa Bay, or the connections to get into a fancy country club like Avila Golf and Country Club. This article is all about helping you play on some of Tampa's best golf courses for $50 and under. Fore, please! 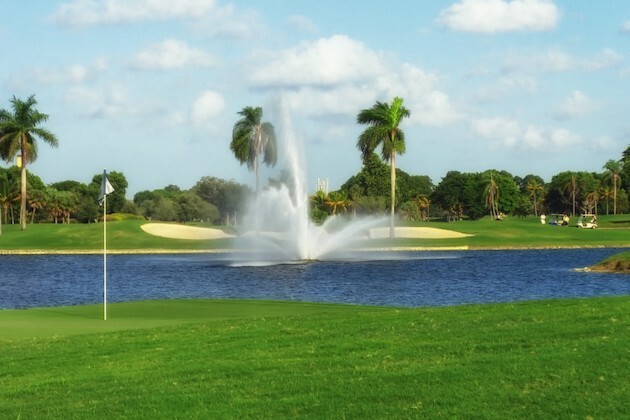 Westchase Golf Club, located in North Tampa's Westchase community, is renowned for its pristine playing conditions, challenging layout, and its natural beauty. The course winds through 213 acres of lakes, woods, wetlands, and conservation areas, with four sets of tees to accommodate everyone's skill level. So how do you get in to play such a premium golf course under our $50 limit? If you tee off around lunchtime on weekdays, or in the afternoon on weekends, the greens fees drop below $50. Keep an eye on the clock (and the weather) and you can experience one of Tampa's top golf courses at a very affordable price. Way up in Odessa, just barely within Hillsborough County, Eagles Golf Club offers two beautiful and challenging courses for golfers of all skill levels. The Forest Course measures up to 6604 yards, with its drivable par-4 third hole, the signature island green on the 6th hole, and two tricky but reachable par-5s on the back nine. Accuracy is the name of the game on this course The Lakes Course, measuring just over 7000 yards from the championship black tees, is a more traditional Florida course. It features wide fairways for driving and of course, plenty of water. Two of the holes on The Lakes were included on the Tampa Bay Times' "dream 18" course of holes around Tampa Bay. To get under our $50 limit, book a weekday tee time, or start your round a little later in the day on weekends. Rates come down as the weather gets hotter, so if you can stand the heat, you can get a nice deal. This will help you save a few dollars for the Eagles' hole in one contests! On one par-3 on each course, you can put down $2, $5, or $10 and take your best shot at the pin. If you get a hole in one, you can win up to $20,000! If not, at least you get a free beer if you bought the $5 or $10 ticket. Also in New Tampa, Pebble Creek Golf Club is a popular golf course with local residents, USF students, and anyone who wants a fun round of golf at an outstanding price. You can play Pebble Creek during the prime weekend morning times for just $39.95, and even less later in the day, or on weekdays. Membership can save you even more money, plus it gives you reciprocal benefits at Wentworth Golf Club in Tarpon Springs, Plantation Palms Golf Club in Land 'O' Lakes, and Crescent Oaks Country Club in Tarpon Springs. Make sure to stop by Mulligans Irish Pub on the property for delicious food, daily specials, and weekend entertainment! The City of Tampa runs three public golf courses, and like the others, Babe Zaharias Golf Course has an interesting history. In a previous life as Forest Hills Golf and Country Club, the course was purchased by Zaharias herself and she managed it until she died of cancer in 1956. It then closed and spent almost two decades in disrepair, becoming a haven for off-road motorcyclists and neighborhood youths while housing developers tried to seize the land next to the booming Carrollwood neighborhood in North Tampa. In 1974, the city took over and reopened the course, and the Tampa Sports Authority has managed it ever since. "The Babe" is not an especially long course, but it has several tricky doglegs, dangerous water hazards, and deceptive short holes, making it much more of a challenge than it may appear. You can play this affordable Tampa golf course for under $35, even on weekend mornings with a golf cart, and Babe's Clubhouse offers cheap breakfast, lunch, and drinking options. Located near Tampa International Airport, Rocky Point Golf Course's history goes back over 100 years, not all of it as a golf course. It started out as one in 1911, but it was closed during World War II and used as a holding center for prisoners of war. In 1953 the federal government sold the land back to Tampa for $1, who in turn leased it to Curly and Merle Hurtman on a 25-year lease. The Hurtmans reopened the course and managed it until the lease expired in 1978. The Tampa Sports Authority then took over managing the course, and it's still in their possession. While you don't have to worry too much about trees at Rocky Point, there's plenty of water to contend with -- ponds along the fairways and next to greens, and some mischievous creeks waiting to claim overhit or underhit drives. Like all of the TSA's courses, Rocky Point uses dynamic pricing, but you can still tee off for 18 holes on a weekend morning and ride in a golf cart for under $40. If you play on weekdays, you can get some fantastic happy hour specials at The Point Grille -- $2 drafts, $3 well drinks, and $4 burgers. This North Tampa golf course started out as a 9-hole course built by Palma Ceia Golf & Country Club caddies on the site of a segregated city park in the early 1950s. In 1976, Rogers Park Golf Course was placed under the management of the Tampa Sports Authority and it became an 18-hole course. It's been renovated twice since then, the most recent a $4 million effort to completely replace the greens and spruce up the formation of the now 18-hole course. Rogers Park is bound on three sides by the Hillsborough River, and water hazards become a big factor once you reach the back nine holes. Greens fees peak at around $35 for a weekend morning, including a cart. The Claw, also known as the USF Golf Course, is right across Fletcher Avenue from student housing at the University of South Florida. It's probably the toughest course on our list. The course measures almost 6900 yards from the dark green tees, and the tight fairways, sharp doglegs, and numerous water hazards have frustrated many a USF student trying to squeeze in a round between classes. The good news is The Claw is also the cheapest 18-hole course on our list. There are lots of tee times available for $25 and under, even on weekends. Tee off on a weekday morning and you get 18 holes plus lunch at Rocky's Grill for an even $30. The Claw also offers footgolf, a variation of regular golf where players try and kick a soccer ball into 21" diameter holes on a shortened golf course. Footgolf is available beginning at 2:00 p.m. every day. Looking for the links golf experience without traveling all the way to Europe? Summerfield Crossings in Riverview, near the South Shore, is the course for you. It offers all the hallmarks of links golf -- undulating fairways, dastardly rough and pot bunkers, some tight out-of-bounds sections, and tricky greens. The 15th hole, a Par 3, features an island green where even experienced golfers will struggle to get close to the pin. Peak rates at Summerfield are around $45 per person on weekend mornings, with lower prices later in the day and on weekdays. Doc's Grille is open six days a week for lunch, and offers a breakfast buffet Sunday morning. If you'd rather kick your way around the course than drive and putt, you can play footgolf here, too. Sometimes there just aren't enough hours in the day to deal with all your boring responsibilities and still get in some golf. For those days, there's Terrace Hill Golf Club in Temple Terrace. This nine-hole track is the only lighted golf course in Tampa Bay. Tee times run as late as 8:30 p.m., giving you the opportunity to play your entire round under the lights. It's not a particularly difficult course, so it's a good choice for beginners. And hey -- night golf! Why go to TopGolf on a Friday or Saturday night when you can go to actual golf? Since Terrace Hill is only a nine-hole course, you can get in a round for between $15-$20. The driving range is lit up too, letting you practice long after the sun sets. There's a catch on this entry. Bay Palms is at MacDill Air Force Base, so you have to be active duty/retired military, reserve components, DoD civilians, or a family member in order to play here. If you fall into one of those categories, then you'll enjoy the two 18-hole golf courses (plus another footgolf course), the lighted putting green, the 24-hour driving range, and the huge clubhouse and veranda. Rates depend on your military rank, with airmen (E1-4) able to play for just $10. Greens fees max out at $35 for civilian guests on the South Course. For some great places to eat and happy hour hotspots after your round of golf, visit the rest of 813area.com. While you're here, sign up for free email updates so you'll always know about the biggest events and the best things to do in town!